The minutes from the Federal Reserve’s September Federal Open Market Committee meeting were released Thursday. The Fed Minutes detail the discussions and debates which shaped the central banker’s launch of its third round of qualitative easing since 2008. The minutes also give Wall Street insight into future monetary policy. 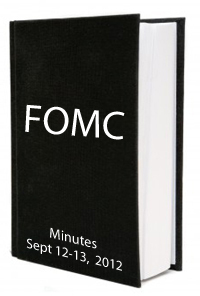 At 6,987 words, the Fed Minutes provides a level of detail that was unavailable via the FOMC’s post-meeting press release, a documen that, by contrast, ran 562 words. Despite its large word count, there was very little that was new or surprising in the Fed Minutes, though. This is because, since the Fed’s last meeting, Federal Reserve Chairman Ben Bernanke has publicly clarified and re-iterated the Fed’s positions on employment, housing and inflation. The minutes provide a strong backdrop to his comments, however. For example, with respect to the jobs market, Fed members deemed employment “disappointing”, noting that growth in payrolls has been slower in 2012 as compared to 2011, and that the expansion rate of today’s job market is too slow to make significant progress against the national unemployment rate. Of greatest interest to home buyers in Scottsdale and rate-shopping refinancers, though, was the Fed’s discussion of its QE3 program. The program was introduced to help suppress mortgage rates nationwide which, the Fed believes, will make “broader financial conditions” more accommodative. The Fed plans to purchase $40 billion in mortgage-backed bonds monthly for a “considerable” period of time after the U.S. economy has already shown signs of full recovery and, since the launch of QE3, 30-year fixed rate mortgage rates are down 19 basis points to 3.36% nationwide, on average. The next Federal Open Market Committee meeting is scheduled for October 23-24, 2012.